My sweet tooth is legendary. I’m not one to skip dessert – ever. So you can imagine my (joyful) surprise when I recently stumbled upon the midwestern wedding tradition known as the “cookie table.” Who has been keeping this one a secret? 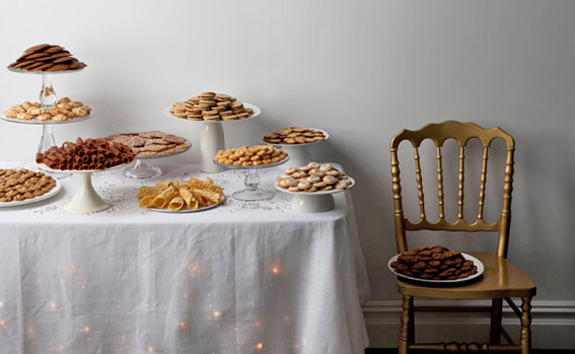 Envision a long banquet table filled with hundreds, maybe thousands, of homemade cookies. Each one is more fanciful than the next. Years of family recipes handed down from one generation to the next, all on display for the happy couple and their guests to enjoy. Setting up a beautiful display table and providing take home containers for your guests turns this yummy wedding tradition into an easy to do DIY wedding favor. If this charming tradition is one you want to incorporate at your wedding, here are a few helpful hints. You’ll want to enlist the help of friends and family to make it fun, and manageable. Who wants to spend hours and hours in the kitchen in the days and weeks before you say I do? Unless you have the Keebler elves at your disposal, you’ll need some backup. In Ohio and Pennsylvania (where the cookie table tradition is said to have originated) it’s the mothers, grandmothers and aunts of the bride who do the baking. But, if this tradition is new to your family, you may have to organize a day long bake-off to get the job done. Having a kitchen shower? Ask each guest to bring a dozen (or two) cookies that can be frozen and saved for later. Can’t get all the baking done in time? Feel free to mix it up with a combination of homemade and bakery treats. What a sweet gift from all who contribute. 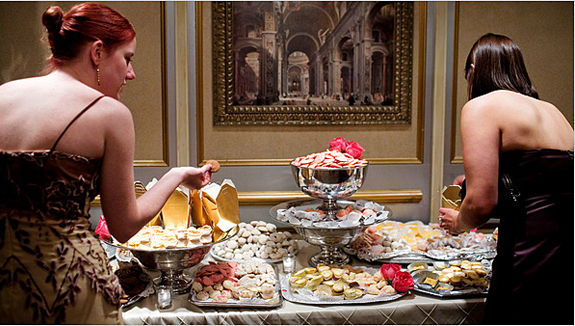 Make sure to alot space at the wedding reception for a banquet table dedicated to the cookies. 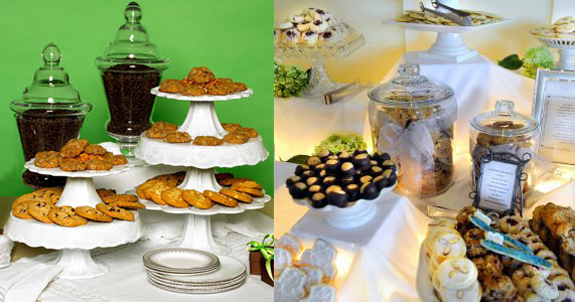 Use (and borrow) cake plates, cookie stands and jars of varying heights to create interest. Vintage and antique stores sell some beautiful and inexpensive stands. Purchase take home boxes at bakers supply stores or order boxes online. How about Chinese take-out containers as cookie favor boxes? I also love the idea of adding in bowls of colorful candy to the display. Use pretty place cards to identify the types of cookies and who make them. Be creative and make it fun. How about offering “shots” of milk along side the cookies? This is one tasteful DIY tradition that will leave your guests smiling.